There are people out there who have our best interest in mind and until we need their assistance, we don’t typically give them any attention. Those individuals are on duty 24 hours a day and regardless of whether they are on the job or not, they would gladly lay down their life in order to save ours. Some of those individuals are firefighters, and they work tirelessly around the clock to ensure that we are safe from house fires, industrial fires and even from injury resulting from automobile accidents. That can clearly be seen in this video, which took place in Russia. 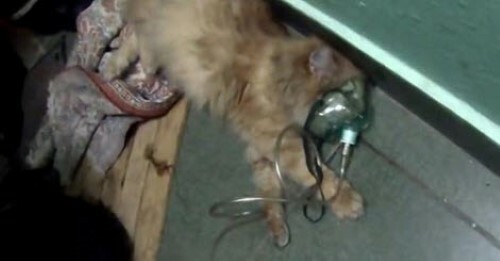 In a house fire, it can be very difficult to breathe because of the smoke and apparently, this cat was overcome and unless he received help, he would certainly not survive. Fortunately, the quick thinking fireman in this video were able to counter the effects of smoke inhalation by putting the cat on a respirator. They held the oxygen mask over the cats face and eventually, he was able to come back to life, although he was virtually dead. It is just another day on the job for these individuals, but it is amazing what they are able to do.